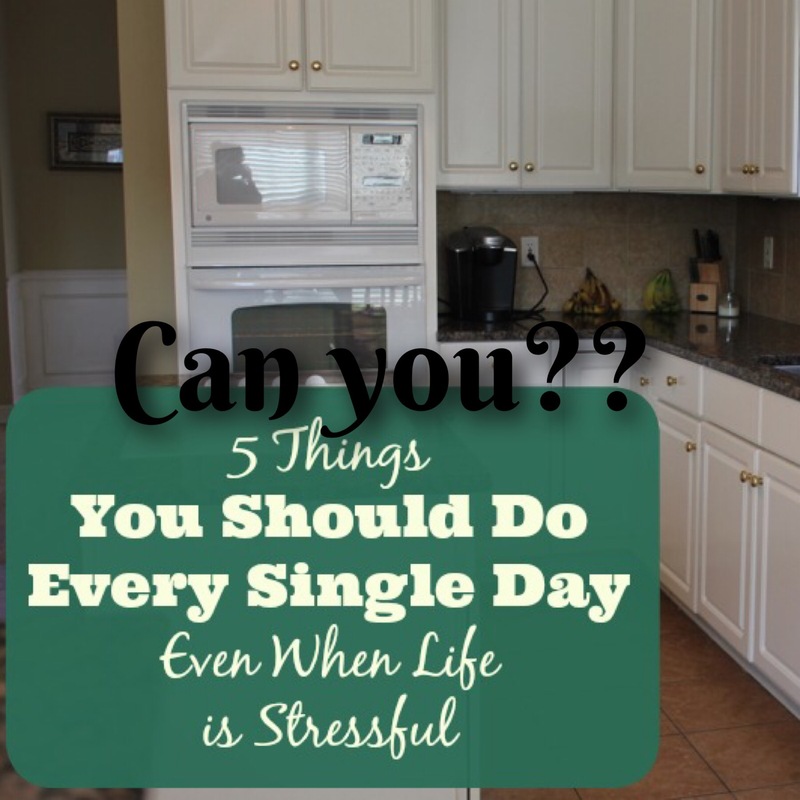 A friend shared a blog post from Money Saving Mom titled 5Things You should Do Every Single Day-Even when life is Stressful. I read with an open mind, but I still ended up on the floor laughing. Please understand, I AM NOT MAKING FUN OF THE WRITER or her ideas!!! I simply find them hilariously funny when trying to apply them to my real, every day life. I also understand that there are some people who live real lives that follow these, my mother is one. I just can’t seem to find the sanity to fit these 5 mundane things into my already over stretched day. I have enough trouble making sure everyone is fed to worry about some of this other stuff. So here it goes. My take on the 5 Things You should do every single day…. I suggest no more than 5-7 items on your to-do list each day, otherwise, you’re probably setting yourself up for defeat and frustration. Yeah, um, so the small OCD tendencies that I have left screaming to be let out really do like this one. But, the borderline crazy, hanging on by a thread person that’s taken over is laughing. My to do list consist of work, pick up penguin, sleep, work. If I’m lucky a load of laundry may get done but that isn’t because I don’t right it down. Honestly, I didn’t watch the video, so I may be missing out on an earth shattering reason as to why I should. Truth be told I like a good ole made up bed. However, it’s not practical. The penguin sleeps in the bed until I pick her up asleep at 5:00 am to take her to the car. So, waking my 5 year old to make a bed is not an option. Working at a prison on a medical floor makes this difficult too. Scrubs, scrubs, and more scrubs. But, on a positive note I have started to assecorize my eyeglasses. The weekends I make an effort but I can’t think straight and I just want to get out of the house. Plus I am making sure the penguin isn’t dressing in 5 layers. This one I am working on. This one I actually do. When it’s just me and the penguin. Then my husband comes home with his eleven days worth and it creates a huge problem. Then the problem becomes one that I don’t want to deal with. So this one is more stubbornness then anything. I can do this by not cooking! And we eat oatmeal, cereal, yogurt. We rinse out our cups or use disposable. But then of course the husband comes homes and starts competing for the Next Top Chef and all hell breaks loose. So, it’s mostly true. Even for someone as crazy as me that that’s 5 things can be done. Maybe not to the perfection the author suggest, but to the level your comfortable with.